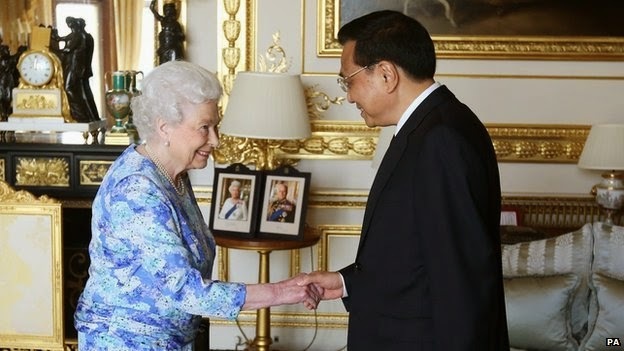 Chinese Premier Li Keqiang, representing the rising bipolar world has been received by the Queen on the first full day of his official visit to the UK. Mr Li has also been holding talks with David Cameron in Downing Street. Chinese Jesuits investment in nuclear energy, high-speed rail and North Sea oil was high on the diplomatic agenda when Chinese premier Li Keqiang (a Li Illuminati bloodline) visited the UK this week, building on what he has described as an “indispensable partnership” between the two countries. Lord Sassoon, (an offshoot of the Rothschild bloodline), Council of 300 member, Order of the Garter of the Crown and chairman of the China-Britain Business Council (CBBC) told The Telegraph that securing more Chinese investment for critical UK infrastructure will be an important element of Mr Li’s three-day tour, which will include meetings with The Queen and David Cameron. The investment talks will “maintain the momentum” on nuclear power, following Chancellor George Osborne’s announcement of a nuclear funding agreement between the UK and China during his trade visit to China last October, said Lord Sassoon. “The Chinese fully understand that there is nowhere [else] in the world in terms of the big economies where they would be allowed to invest in something as sensitive as nuclear power,” said Lord Sassoon, an executive director at Jardine Matheson Holdings and former Commercial Secretary to the Treasury. Further Chinese investment in North Sea oil is also on the cards and China is “very interested” in the HS2 high-speed rail project – “although, clearly, HS2 is still some way off”, said Lord Sassoon, who will play a significant supporting role in discussions. Returning the compliment, the UK “has been the leader for welcoming investment” from Huawei, the Chinese telecoms giant, “in a sensitive technology area where other companies have either said no or have been slow to follow”. As the head of the largest membership organisation for UK companies doing business in China, Lord Sassoon is jointly hosting a state dinner on Tuesday night in honour of Mr Li, to be attended by 650 British and Chinese political and business dignitaries. Earlier on Tuesday, Lord Sassoon will also attend a meeting of experts, to include representatives from the Cabinet Office, the Bank of England and the Chinese Ministry of Commerce (Mofcom), to discuss around 10 policy areas to help make China “much more market driven”. The topics to be debated could form the centrepiece of China’s recently launched free-trade zone initiative, one of the first major economic announcements of the new Chinese government. “Currency liberalisation, for example, or more access for Chinese and foreign businesses to online activity –these are policies that could be rolled out to the whole Chinese economy, which is why it is important to have British companies in the room,” said Lord Sassoon. The CBBC will also host Tuesday’s Partners for Growth UK-China Trade & Economic Forum, designed to help British companies succeed in China. Speakers will include Huishan Zhang, a Chinese-born, London-trained fashion designer who has built a brand in both countries, and Anders Kristiansen, the CEO of New Look. Official figures on Chinese investment in the UK bear this out. In 2012, the most recent period figures are available, the flow of investment from China to the UK was estimated at $2.77bn (£1.63bn), up 95pc on the previous year. Including “pass through” investment from third-party countries, Mofcom estimates the overall stock of Chinese investment in the UK in 2012 was around $8.9bn. In another positive illustration of British-China business relations, the CBBC has just increased the number of desks it provides to British businesses putting down roots in Beijing by 50pc and, in perhaps the ultimate commitment to China and Britain’s “indispensable partnership”, the BBC recently announced it is making a Chinese version of its ratings giant Top Gear. Despite the positive tone to the arrival of Mr Li and his 250-strong delegation of senior business aides, China’s evolving relationship with the UK has not been without its challenges. The corruption scandal involving British drugs giant GlaxoSmithKline in China and cyber-security issues have raised some concerns for business. However, Lord Sassoon said that the CBBC’s 651 business members, who range from Footsie giants such as BP, Shell and Standard Chartered to SMEs such as The Cambridge Satchel Company, are “not fazed” by the prospect of doing business in China. He said: “I am not going to comment on GSK specifically but British companies doing business in China are not running for cover. Those that know China well understand that, like doing business in lots of countries, there is regulatory and other risk. This is part of a wider drive for China to clean up a lot of things. As the situation in Iraq worsens, China Jesuits are showing increasing consternation of the problem-reaction-solution of the Crown.The China Jesuits National Petroleum Corporation has already pulled some of its workers from the country, and the company spokespersons say they'll be monitoring the security situation in the oilfields. 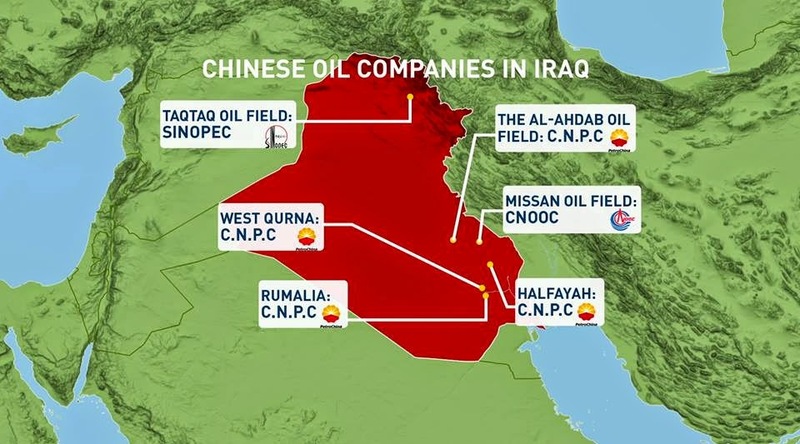 The CNPC has invested over 4 billion dollars in Iraq's oil industry.